Eye Problems & Causes | When should you see an eye doctor? When should I see an eye doctor? Is my condition serious? Eye pain and discomfort can be caused a variety of eye problems or diseases. Lee Hung Ming Eye Centre is an established eye clinic in Singapore which has been operating in Gleneagles Hospital since 2007. Formerly the Head of Refractive Surgery in 2 prominent hospitals in Singapore (Tan Tock Seng Hospital and National University Hospital), Dr Lee Hung Ming is a skilled and trusted surgeon with more than 20 years of experience as an ophthalmologist. Blurred vision refers to the loss in sharpness of vision, resulting in objects appearing blurry, hazy, or out of focus. 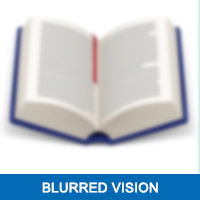 Blurred vision may cause headaches and inconvenience during daily activities such as reading, writing, or working. The causes of blurred vision range from mild to severe. If you have been experiencing blurred vision for a long period of time, it is best to consult an eye specialist. 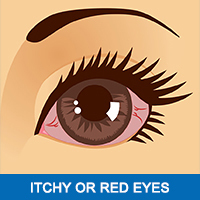 Itchy eyes may be accompanied by dryness or redness. Although irritating, they are generally mild eye problems that should subside with time. However, prolonged symptoms may be indicative of a potential eye disease or infection. An eye doctor will be able to advise you on the appropriate treatment. Itchiness or redness may also be the result of improper contact lens care or substandard contact lenses. If you suspect that your lenses are the cause of a problem, consult an optometrist or ophthalmologist promptly. Pain in the eyes can be caused by a multitude of reasons. 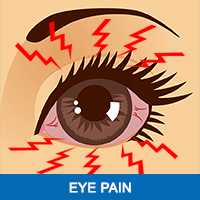 Eye pain can be indicative of both mild and severe conditions. Mild eye pain may be the result of dry eyes, allergies or infections. However, eye diseases such as blepharitis and acute glaucoma can cause pain in the eyes as well. If you have sudden, recurrent, or severe eye pain, it is best to consult an eye specialist immediately. Tears keep our eyes moisturized, protect them from infection, and help to heal any surface wounds. In a normal eye, tears are constantly produced to keep the surface of the eye wet. 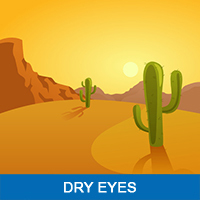 Dry eye syndrome occurs when not enough tears are produced to lubricate the eye. Dry eyes are one of the most common problems faced by patients. If severe, they can cause significant disruption of daily activities. An eye specialist will be able to determine if there are any underlying medical reasons for dry eyes, and also prescribe preservative-free lubricating eye drops (Systane, Optive) to ease dryness. Floaters are small, black or white spots that appear in vision. Floaters are a result of the natural aging process and, although annoying, are generally not a cause for concern. They usually diminish over time. You may read more about floaters here. However, sometimes floaters may be an indication of a more serious eye condition. A sudden increase in floaters, flashes, or bleeding in the eye may be indicative of retinal tears or retinal detachment, which can lead to blindness. In such cases, it is imperative to consult an eye specialist immediately. 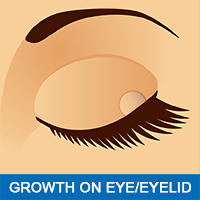 Growths on the eye or eyelid are usually caused by bacterial infections. Left untreated, growths may lead to serious complications such as corneal ulcers. If you notice a growth on your eye or eyelid, it is best to have it examined by an eye specialist immediately.